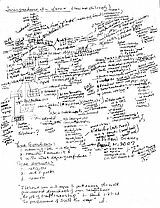 Three years ago, Professor G. Robert Blakey at Notre Dame Law School apparently sketched out this synthesis of law and philosphy in about fifty minutes. The newly-transcribed version appears here. As of May 14, SCOTUS is proposing changing its Rules, one of which includes mandating the use of “New Century Schoolbook” (NCS) font, which is not even part of the standard package of fonts offered by either MS Word or Wordperfect (a/k/a the Bane of Mankind). Of curious note, it appears this font is trademarked by Linotype, leading to an interesting question of the propriety of SCOTUS requiring parties to conform to a rule which solely benefits a private company. Beyond the questionable monetary effects of this rule, this proposed requirement is nonetheless mildly vexing. There are several other, more pleasing and “bookish” fonts already available in MS Word and Wordperfect, including Garamond, Century, Book Antiqua, and Bookman Old Style, if SCOTUS merely wished to make the briefs more readable. After comparing printouts of NCS to Garamond, Century, Book Antiqua, and Bookman Old Style, it appears that there is no distinguishable difference (in print at least) between Century (which is already loaded in MS Word and Wordperfect) and NCS. If you’re going into competitive cycling, you want to be like Lance Armstrong. If you play basketball, the model is Michael Jordan. Golf? Tiger Woods. If you’re going to be Chief Justice, you want to be like John Marshall. Now, I hasten to add that I am not saying I ever could be, any more than anyone who bikes, plays ball, or golfs thinks they could be like Armstrong, Jordan, or Woods. But Marshall is certainly the model to emulate, in his analytic rigor, coherent vision, collegial leadership, and dedication to both his country and the law. I also admire William Rehnquist because I had the opportunity to observe first hand his skill as a jurist and administrator. The Trumpeter’s sister is a judge on the Third Circuit Court of Appeals: the Hon. Maryanne Trump Barry. Eleven year-old Jamison Stone bagged this 9 foot-long and 1,050 lb. boar a few weeks ago on a commercial hunting preserve in Georgia. Besides the obvious “wow” factor, I want to know how this elephantine beast was wandering around a relatively small, 2,500 acre ranch without being discovered. Just the hole he made in the brush should have been pretty easy to track. Of additional note, the AP story says he shot this megafaunal pig with a .50 caliber revolver (as opposed to the much more well-known Desert Eagle, which is a semi-auto and fires 3-400 grain bullets), the only one made I know of being a S&W 500, which shoots 650 grain bullets. For those non-Second Amendment lovers, that is a HUGE round that would be hard for a grown man to fire once, much less nine times, even at a target as big as this. Compare the obvious emotion and brutal honesty of Rep. Boehner from this floor speech to any of the polished yet vague soundbites to come out of Obama, Hillary, Edwards, Schumer, and the like, regarding why we’re in Iraq. Tell me who you trust more. What other college football coach would tell his team that just defeated the so-called “best college football team ever” in—hands down—the greatest college football game ever played, that he hoped that victory wasn’t the best thing the players ever do in their life.